Kristen Anderson grew up in Northern Indiana where, sadly, there were no caves nearby. When she arrived at college she joined the local grotto and was introduced to the small, tight Massachusetts and upstate New York caves. It was awesome. Since then she has moved to the DC area and is currently involved in the Kimble Pit survey in Germany Valley, West Virginia. This will be Kristen's second expedition and she is very excited. Outside of caving she also enjoys rock climbing, backpacking, and ceramics. Kristen is an aerospace engineer and works on TESS, a satellite which will look for planets outside of our solar system. 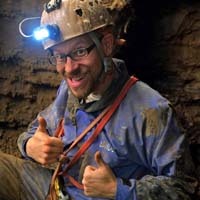 Ryan Baker has participated in deep cave expeditions in China, India, Belize, Spain, France, Mexico, and Georgia/Abkhazia, including expeditions to both the deepest cave in the western hemisphere (Sistema Huautla) and the deepest cave in the world (Krubera-Voronya). Ryan enjoys caving because it helps him avoid getting sunburned. He is a librarian from California. 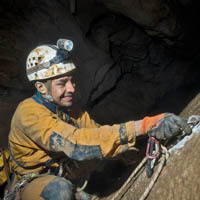 Oscar Berrones has been a caver for over 30 years. His caving career began while he was in his teens, when he became a member of the Red Cross and ASMAC (Asociación Scout de México Asoc. Civil) in San Luis Potosí, México, near the Sierra de Álvarez. His weekends were spent in vertical caves and deep pits, including Golondrinas, Guaguas and Sótano del Barro. 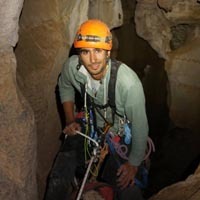 He was one of the founders of APME Club (Asociación Potosina de Montañismo y Espeleología) and has explored over 500 caves in the Sierra de Álvarez alone. Oscar became a full cave diver after he found sumps in some of the caves in the area. He has been a part of cave rescues, led expeditions in the Sierra de Álvarez, and plans to continue his cave and cave diving projects. He lives in Austin, Texas and is a member of the UT Grotto. Oscar has a passion for cave photography, and loves training his 13-year-old daughter to become a caver. He is self employed as a sustainable home builder, and he and his wife dream of retiring on their land in the mountains of San Luis Potosí. 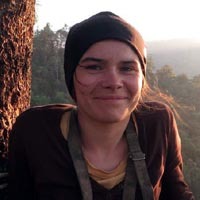 Kasia Biernacka is an expedition caver and cave photographer based in Poland. Kasia has been exploring deep caves for 15 years, mainly in Spain (Picos de Europa) and in Mexico. 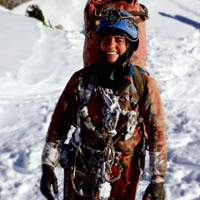 She participated in seven expeditions to Sistema Cheve in the Sierra Juárez, Oaxaca (Cheve, J2 and Cueva de la Mano) and in three expeditions to Sistema Huautla in the Sierra Mazateca, Oaxaca (Sótano de San Agustín and La Grieta). Her underground pictures have won many cave photography contests around the world; you can see them at kasiabiernacka.com/caves. During the 2013 expedition to J2 Kasia was one of the underground cameramen filming for the Discovery Channel documentary "The Cave". She loves Mexico where she studied and she speaks good Spanish. When Kasia is in Poland, she works for Ladek Mountain Festival as Film Competition Director. Photo by Mikołaj Harasimowicz. James Brown is one of the world's foremost sump divers. In the late 1980s he migrated from wreck diving to exploring tight side-mount underwater tunnels in New York state with open circuit SCUBA. In 1990, James became the defacto lead test diver for the Cis-Lunar series of rebreathers and he has logged hundreds of hours on five generations of closed-circuit diving equipment, including the transition to the Poseidon Mk6. He was a participant on the dive team during the 1994 National Geographic Society expedition to San Agustín, Huautla, and is a major character in the book Beyond the Deep. He was a lead diving member of the 1999 Wakulla 2 Expedition which created the world's first 3D cave map. In 2006, he conducted the first solo exploration of Sump 2 in J2 and was the discoverer of Sump 3. In 2009, he was a member of the support dive team that initially set up Camp 4 in J2. He is a member of the 2013 J2 lead diving team. 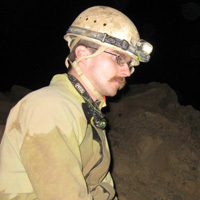 Adam got his start caving in 2003 with the West Virginia University Student Grotto, then spent several years caving in the TAG region. Most of his current efforts are focused on the exploration of the caves of Germany Valley, West Virginia. He also participated in the 2015 expedition to Sistema Huautla. He enjoys long walks in gypsum sand boreholes and LED-lit cave gruel dinners. He is an avid rock climber, and works as an engineer in the powder metal and 3D printing industry. 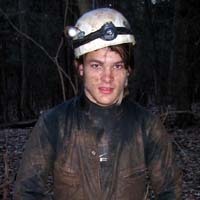 Marcin started caving in 2008 with Warsaw Speleoclub. 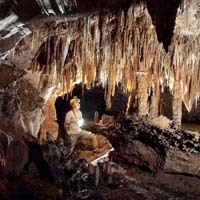 Since then he has visited many caves in the Tatra mountains and other regions around Europe. Inspired by stories from "big caves" he has dreamed about joining a project like the J2 Expedition. For a living he runs his own rope access business. Privately he is a husband and father of three year old Basia. Matt grew up caving in Arkansas, and first became interested in expedition caving as a teenager while reading the account of the 1994 USDCT caving expedition to Huautla in National Geographic. 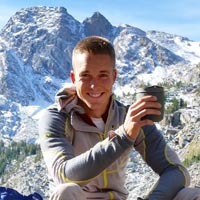 Since beginning college, he has spent about one month out of every year on caving expeditions including expeditions to Alaska, Sumatra, Peru, México, France, Slovenia, Croatia, and Lechuguilla. 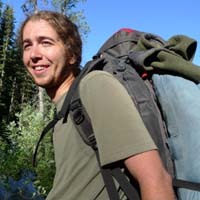 Matt participated in all of the previous J2 expeditions, was one of the few lucky team members to camp and explore beyond the sump in 2009, and co-led the 2010 expedition that connected Last Bash and J2, discovering the route that will be used to haul diving gear for the 2013 expedition. After finishing dual undergraduate degrees in physics and philosophy in 2002 at the University of Arkansas, Matt moved out to California for graduate school. In 2008 he finished his PhD in theoretical astrophysics at the University of California, Santa Cruz. However, after 10 years of schooling in physics, he saw the light and decided to pursue his true passion as a career. He spent the last four years as a postdoctoral fellow researching caves, and during the last two years he lived and worked in Slovenia, studying and exploring the caves of the classical karst. This fall he started work as an assistant professor in the Department of Geosciences at the University of Arkansas. Matic has been involved in caving almost his whole life, since his father was also an active caver (and he still likes to go caving from time to time). In the last six years he has become more involved with serious caving, mostly in Slovenia where he lives, and some in France. He is a member of the caving club "Društvo za raziskovanje jam Ljubljana". Matic likes deep vertical alpine caves, and this is where he spends most of his spare time - exploring new caves in mountains around Slovenia. 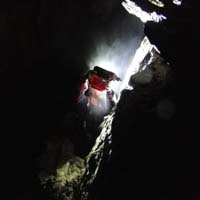 Currently he is leading and helping with exploration of two new alpine caves in Slovenia. In 2011 he was also a part of a short expedition where they helped diver Matt Covington with transport of diving equipment, to dive in a sump in "Renejevo brezno" cave (-1250m, Mt. Kanin). Besides caving he also likes mountaineering, climbing and photography, including cave photography. And right now he is finishing his BCs thesis in computer science. Yvonne Droms started caving in 1967 in Portugal. After moving to the USA, she joined the National Speleological Society in 1985 and has been caving ever since. She is very active in exploration and survey in the extensive cave systems of Virginia and West Virginia. She teamed up with Bill Stone in completing the then-longest bolt-climb in West Virginia by scaling a 306-foot dome in Hellhole. 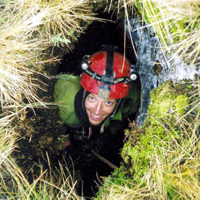 Starting in 2001, she has participated in numerous expeditions to the deep, vertical caves of Mexico: Cheve, Huautla, and J2 in Oaxaca, and in the Purificación area of Tamaulipas/Nuevo León. Yvonne is a Swiss citizen who grew up in Portugal. She is a retired translator, having worked for Rosetta Stone in Harrisonburg, Virginia, and speaks seven languages. Her two children are mathematicians. Yvonne spends her free time caving and helping with caving publications, and also enjoys hiking, skiing, backpacking and mountain bicycling. Tomek has been caving for 25 years and training young cavers for 15. For four years he was the head of the Warsaw Caving Society. He has had the opportunity to cave and discover new caves all over the world (Poland - Tatra; Austria - Lamprechtsofen; Papua New Guinea - Nakanai; México - Sistema Cheve, J2, and Cerro Rabón; Switzerland - Windgällen). It seems that every discovery he has made so far was done just by chance, especially finding once the deepest cave in the world. Tomek has 20 years experience running his own business, and 10 years experience being an HR professional. 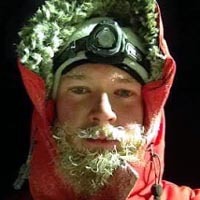 He has two daughters, seven and four years old, and leaving them for a couple of weeks seems to be the biggest challenge of the whole expedition for him. Mike Frazier enlisted into the world of organized caving in 1990. Since then Mike has coordinated the exploration and mapping of the Hurricane Cave system in Colorado which is currently the deepest known granite cave system in the world. 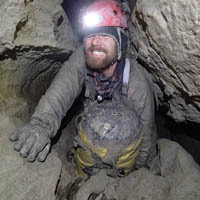 Mike has participated in around 30 caving expeditions which have included trips led by American, Swiss, British, Canadian, and joint Mexican/Austrailian teams. During these trips he has assisted in the exploration of many of México's 1000m deep caves. He has also caved in Guatemala, Belize, Germany, France, Italy, Poland and Switzerland. Mike is currently a co-leader of the Proyecto Cerro Rabon as well as the Proyecto Sierra Mazateca. Mike's education was obtained primarily in the alleyways and deep and dark recesses of the earth. He is currently owner/tree surgeon for Frazier Tree and Shrub Inc. He also knows Bart Hogan, who can order McMaster Carr from anywhere. 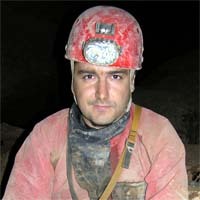 Marcin Gala has been a caver for 22 years. He participated in exploration expeditions to Austria, México, Papua New Guinea, Puerto Rico and Spain. He's fascinated by cave photography and cave diving. Usually he goes for expeditions with Kasia Biernacka and their daughter, Zuzia. They have been exploring in Sierra Juarez with Bill Stone since 2001. Marcin works as a rope access technician on the Norwegian Sea. Katie isn't known to ease into things. In her first month of caving she began sketching and participated in a Castleguard expedition, the longest glacial river cave in the world. She spent the last decade exploring caves in the Rocky Mountains, and has caved in the United States, Jamaica, France, China, Barbados and many expeditions to Mexico including big caves of Sistema Purificación, Sistema Huautla and now Cheve. Favourite moment caving: clamoring up a blank cave wall into a small hole. I felt a blast of cold air in my face and knew this was the passage that connected two caves and made the deepest cave system in Canada. I've never crawled and chimneyed so I fast; I needed to prove the connection was true. It was. Katie is an accountant by day and caves and canyons most weekends. Nikki is a member of the core planning team for Cheve 2017. 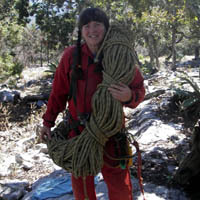 She has been an active member in the expedition caving world for the past eight years. She actively works on projects in West Virginia, Montana, Grand Canyon National Park, Mexico, and most recently on the Picos de Europa expedition led by the Poles in Spain. Nikki currently lives in Salt Lake City, Utah and works as a field instructor for a wilderness therapy company. When she is not caving or in the field for work she enjoys canyoneering and long-distance motorcycle trips. I come from the Calgary area and have always been interested in outdoor pursuits. 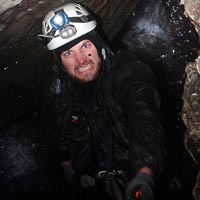 At the age of 20 I started caving with Alberta Speleological Society and found my niche. Exploration of caves is a quest that does not appeal to everyone. To a select few curious and talented explorers, to seek the deepest and strangest places on the planet is a passion. I have delved with these explorers for the last 8 years and have seen some truly unique places. 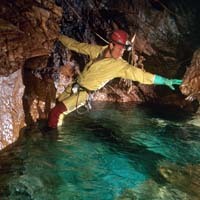 I have helped explore some of Canada's longest and deepest caves. I also participated in exploration beneath the United States, Mexico and Peru. I am consistently thrilled with the wonder of finding something no one has ever seen. I am eager to help on the expedition in Cheve, for it is a chance to work to the bottom with some of the top cavers in the world and extend the depth of understanding of this vast system. Corey began caving in the small caves of western Maryland during early childhood. By age 10, he had begun to take an interest in actively discovering and documenting new caves. Most of his caving activity has been focused in Maryland, West Virginia, and Massachusetts, where he has been involved in the documentation or discovery of over 100 new caves, although he has visited caves in most every Appalachian state. In 2011, Corey co-discovered a deep and challenging cave system in Western Maryland, which has been pushed to a length of roughly two miles and a depth in excess of 400 feet. This is both Maryland's first multi-mile cave system, and the deepest cave currently known and publicized in the northeastern United States. Corey is deeply interested in the interaction of structural geology with hydrology in karst aquifers, and in how this interaction is expressed in cave morphology. He works as a geologic interpreter, electrician, and general handyman at Crystal Grottoes Caverns of Maryland, where he is presently engaged in developing a hydraulic system for removing clay fills from cave passages. He holds a Bachelor's degree in Philosophy. 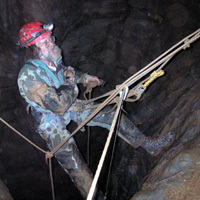 John Harman started caving 12 years ago in West Virginia. He has since been heavily involved in the exploration of the Hellhole System, a nearly 40 mile long technically challenging cave in Germany Valley, West Virginia. John participated in a 2009 expedition to the Purificación region of México and frequently works on other caving projects in the eastern US. 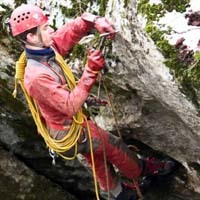 John enjoys technical rope work, digging and aid climbing. John works as an electrical engineer and his above ground hobbies include designing custom electronics, backpacking and climbing. 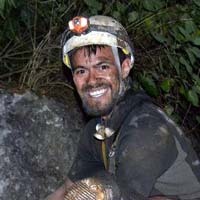 Fernando Hernández is a caver from Monterrey, Mexico. He came from a rock-climbing background, and discovered caving when he moved to Texas and saw no mountains around. So instead of going up, he decided to go down. He never looked back after that. 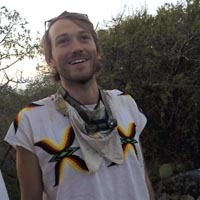 After his introduction to caving he went back to México and has participated in trips to the Múzquiz area in Coahuila, Minas Viejas in Nuevo León, Cozumel in Quintana Roo, and the 2016 PESH expedition to Sistema Huautla. He has also participated in extensive Texas crawling, I mean caving, and a tank haul in Main Drain cave in Utah. Currently, he works for the City of Austin in the Watershed Protection Department assisting the groundwater team. Chris Higgins has been exploring and photographing caves for over a decade. He grew up in Knoxville, Tennessee as an avid reader of the NSS News, where his dreams of deep caving first formed. 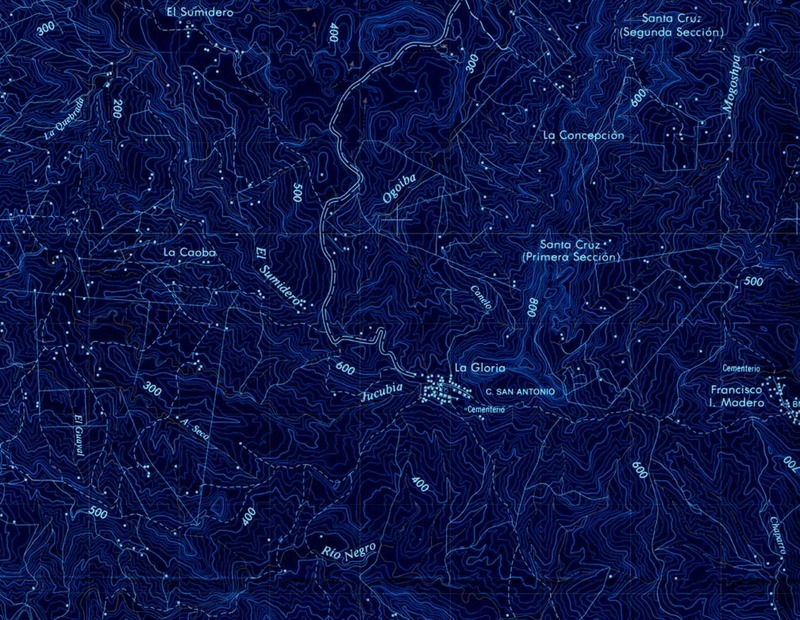 Chris began photographing caves when he first started exploring local caves in Tennessee. His passion for photography evolved as his desire to show others what lies beneath grew. Over the years, his photography has taken him on expeditions all over the United States, Mexico, and Peru, as well as trips in the Bahamas where he joined cave diving teams to explore and photograph the crystal blue waters. In 2015, Chris joined the Sistema Huautla cave team as a deep cave explorer and photographer. 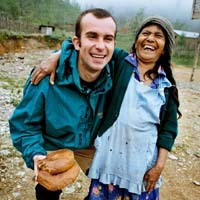 You can see pictures from his expedition at www.chrishigginsphoto.com. This year Chris joins the U.S. Deep Caving Team in Cheve for the first time in his caving career after years of researching and dreaming of the deep passages which lie beneath. 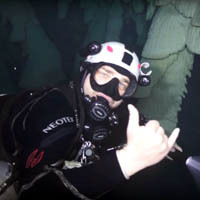 After leaving his scientific career in chemistry and biotechnology, Witek followed his overhead diving passion and moved to Sardinia in 2013, becoming a full-time cave diving guide and instructor. After a 7-month-long season underwater, he usually spends the winter in Poland exploring flooded uranium mines, caving and diving in the Tatra mountains. During his years in Sardinia he explored multiple underwater and dry caves, focusing on Bel Torrente cave where he participated in explorations in 2014, 2015 and in 2016 spending 4 days after 1.2-km-long Sump 1, exploring and mapping over 1.1 km of new passages. Passionate about cave photography and videography, enjoying climbing, sailing, traveling and increasing the world's entropy! 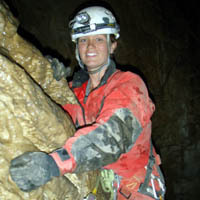 Kathryn started caving in 2012 while in college at Texas A&M University at Galveston. While at Texas A&M she helped assist with trips and training for the Biospeleology class. A majority of her caving has been in Texas helping with tank hauls and helping lead trips for girl scouts and college students. She has also participated in trips to Laguna de Sánchez and Minas Viejas in Nuevo León, New Mexico, Tennessee, and Kentucky. When she isn't caving, you can find her hiking and camping with her dogs or scuba diving. Jake is a world traveling adventure seeker. From humble beginnings hitchhiking and train hopping to recently living a hunting and gathering lifestyle on tiny islands in the South Pacific, he has been roaming the world in search of the exceptional. Jake currently works for the US National Science Foundation in Antarctica undertaking logistical coordination and scientific support. 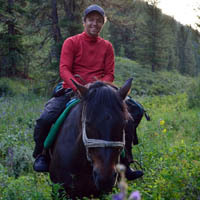 He is experienced in outdoor survival and enjoys high altitude trekking, geocaching, and exploring the unknown. This will be Jake's first caving expedition. Tomasz is a Polish born Canadian, who has lived in Calgary and the Canadian Rockies for the last 13 years. He is an IT professional who splits his free time between caving and cave diving in Canada's cold sumps and the warm water of Mexico's cenotes. Cave diving turned out to be a bit of an obsession, looking for new unexplored dry and wet passages, which spilled over to multiple travel trips to Mexico, Florida, within Alberta, and beautiful British Columbia. Tomasz has participated in multiple projects as a push diver and dry caver. He is passing on his love of climbing and adventure to his two children, and letting his wife live vicariously through his adventures. Jason Lavender started caving over a decade ago with a passion for exploration of the unknown. Living near some caving hot spots in middle Tennessee, he has an abundance of project caves. He spends most of his time in the TAG region working on mapping and exploration projects. Last year he joined the 2016 PESH expedition to Sistema Huautla. In his spare time he also enjoys rock climbing and hiking. 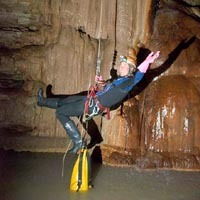 Jon Lillestolen began caving in Tennessee in the mid-90s and quickly learned to enjoy deep caves. He has participated in expeditions to the US, Mexico, Spain, France and Costa Rica and has helped with the exploration of six 1000-meter-deep caves. 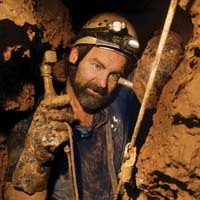 He is an avid caver, climber, and cave diver working on cave projects in his home state of Virginia as well as in West Virginia, Tennessee, Alabama, Georgia, Florida and Kentucky. Adrian Miguel-Nieto has been a member of the Association of Hiking and Mountaineering of the National Polytechnic Institute (AEMIPN Spanish acronym) since 2008. 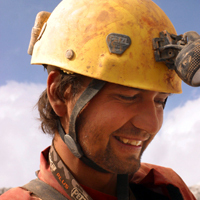 Since then, he has been participating as an instructor in speleology courses and workshops. He has also organized explorations in the Mexican states of Oaxaca (Sierra Mixteca), Puebla (Sierra Negra) and Hidalgo (Sierra Hidalguense). He participated in Proyecto Espeleológico Sistema Huautla (PESH) in 2015 and 2016. Adrian works as a biochemistry teacher. Klemen's childhood was filled with outdoor activities, his father being an avid alpinist who succeeded in passing his love of the outdoors onto his children. Klemen enjoys spending his time mountaineering, ski touring, trail running and mountain biking. Maybe it was his rebel spirit or just the pleasure of discovering the unknown that got him involved in caving - the opposite of alpinism almost. 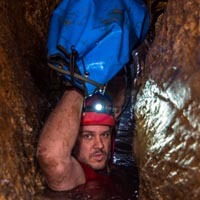 He started caving in a caving club in his home town Novo Mesto in 2009. Klemen has mainly been exploring in Southeast Slovenia and has joined a couple of expeditions in Bosnia and in Montenegro. 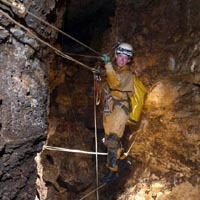 He is also an active caving instructor with the Caving Association of Slovenia. Besides caving, Klemen is also a member of the First Responder Team with the Slovenian Red Cross and tries to dedicate as much time as possible to medical trainings. Mark Minton has over forty-five years caving experience in most of the major cave regions of the United States and México. He also participated in three paleontological expeditions (1992-94) to the caves of Madagascar, which visited that country's deepest and longest caves. He has been a leader and/or member of many expeditions to the deepest caves in the Western Hemisphere, including five caves over 1000 meters deep, one of which he discovered. Mark has received several flag awards and exploration grants from the Explorers Club and has had over 225 articles published in various caving journals and the Explorers Journal. He continues to be very active in original exploration in Virginia, West Virginia and Mexico. Mark is the Director of Sponsored Research for the USDCT. When not caving, Mark worked as an organic chemist for 30 years and is now retired. He lives in Virginia with team member Yvonne Droms. Artur started caving with his home town grotto "Gawra Gorzów" in Poland in 1989. Since then, he has been to caves around the world, including Krubera Cave, the deepest cave in the world, as well as three times with Bill Stone's expeditions. His latest hobby is travelling the globe in search of deep pits with his buddies from "Żagań Grotto". A custom caving suit maker in Poland, after reading Artur's dimensions, sent him the message: "Redo the measurements, those were taken from a gorilla, not a human." His measurements were correct. Matija Perne has been visiting caves since kindergarten. He persuaded his parents to join a caving club together in 1995. 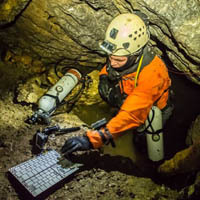 Since then, he has been exploring caves as a member of the society for cave exploration, Ljubljana, mostly in Slovenia, mostly during weekends. The deepest one he visited and mapped is Renetovo brezno, where he reached the sump at -1238 m in 2006 and returned there as a part of Matt Covington's diving team in 2011. He is currently working in numerical modelling of processes in fuel cells, while he also spent a lot of time modelling karst phenomena. He recently obtained his Ph.D. in Karstology. Hugo is from San Luis Potosí. 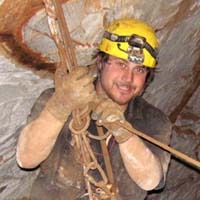 He began speleology activities in 2005 in the APME Club (Asociación Potosina de Montañismo y Espeleología). He had the opportunity to collaborate on several projects such as Joya Honda exploration in his home state. In 2009 he supported a 3D mapping project with APME and Norway University in Sótano de Golondrinas, Aquismon community, S.L.P. In 2010 he joined the E.R.M. 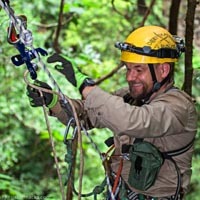 (Espeleo Rescate México) for training for cave rescue techniques. For work, Hugo develops projects for health and safety for the automotive industry, and he is currently working for a logistics company. He has practiced music since he was a kid, playing drums and percussion; Hugo is looking for the perfect mix, creating music in caves with natural cave sounds and artificial (synthesizer keys) sounds. In his free time, he likes amateur climbing and trekking, and other outdoor activities. I got my first taste of caving at the age of 11 in a small West Virginia cave; there were a few more trips before I went to college in Syracuse, NY. There I started caving with the local grotto and caught 'The Bug' in 2010. Since then I've been caving almost every week for the past seven years, which has taken me to over 200 caves in the eastern US, and to China and Mexico. Whether it's multi-day camp trips, sketching virgin passage, hauling gear for sump divers, or teaching caving skills and practice to new cavers, I'm happy to be underground. As one of my best friends put it, 'The best part about caving is the cave.' When not caving I live and work in Syracuse running a small shipping company. 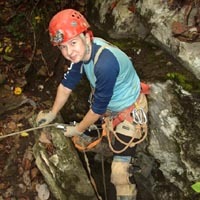 Lauren Satterfield started caving in 2008 with members of the Dogwood City Grotto in the southeastern USA. She spent her early caving career in this area and fell in love with vertical caving. After several years of recreational caving, she learned the basics of bolt climbing, sketching, and cave photography. She has participated in survey and exploration of the TAG area ever since, and took her first cave rescue training through NCRC (National Cave Rescue Commission) in spring of 2016. Lauren has been underground in several states in the US and has participated in international expeditions to the Viševnik and Kanin areas of Slovenia in 2015 and 2016 with Matt Covington and the Društvo za raziskovanje jam Ljubljana caving club. Recently, she began exploring new and re-discovered caves in Cyprus, most of which had not been visited since the British left the area in the 1950s. In addition to caving, she enjoys rock climbing, mountain biking, and hiking. She currently works as a PhD student studying carnivore ecology at the University of Washington in Seattle. Yuri started caving in 1979 at the age of four with his father, then an active member of the Novosibirsk State University caving club. 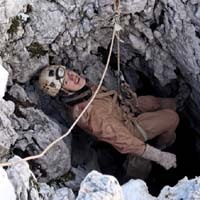 In 1995 Yuri co-founded Novosibirsk Diggers Caving Team with which he explored numerous caves of the nearby Altay Mountains. In the following twenty years Yuri worked in caves of Switzerland, France, North America, Sweden, Iceland, Norway, Slovenia and Montenegro. 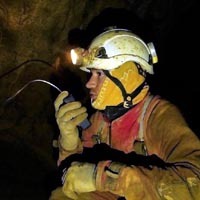 Yuri is a member of National (USA), and Swedish Speleological societies. 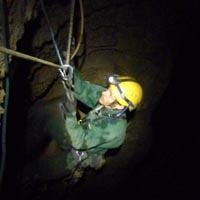 Since 2007, Yuri has been a regular member of USDCT expeditions to deep caves of north-eastern Oaxaca, México. In his other life Yuri holds a PhD in Biology and is interested in epigenetic mechanisms that control how our genome is used during our lifetime. Currently he pursues his interests as Associate Professor at the Department of Molecular Biology of Umeå University, Sweden. Yuri is married and has two daughters. Bev Shade started caving in 1991, in local Texas caves, got into big caves in Mexico in 1992, and was hooked. Over the past 25 years she's caved in the US, Mexico, Guatemala, Honduras, Costa Rica, Puerto Rico, Argentina, Poland, Germany, Slovenia, and Thailand. She finished her MS in Geology from the University of Minnesota in 2002 studying quartzite caves, and worked as an environmental consultant until changing careers. She finished a BS in Nursing from the University of Texas in 2015, and currently works as a registered nurse on a cardiac/infectious disease unit in Austin. She has a special place in her heart for digging, maps, and mentoring cavers who are excited about learning new skills. Vickie is a member of the core planning team for Cheve 2017. She first began project caving in 2004. In total she has spent more than two years working on expeditions in the US, Mexico, Russia, and Nepal. In parallel, Vickie has spent ten years working with the field robotics team at Stone Aerospace to design, build, test, and field robots designed to explore Europa-analog environments on Earth. In this way she has participated in three field robotics expeditions to Antarctica and led two field campaigns on the Matanuska Glacier in Alaska. Rafał Sieradzki has been caving for three years, and still doesn't really know why he started to do it (most likely it's a kind of mental disease). He has been caving mostly in the Tatra mountains, and also in Switzerland (Windgallen). He is a fan of traveling on bicycle. He also has been a member of a climbing expedition to Afghanistan (in Wakhan Corridor, Small Pamir), where he was working as a camera operator and film editor. He works at his own company as a copywriter and filmmaker. Jola Sikorska is a member of the Warsaw Speleoklub. She has been caving in the Tatra Mountains. Jola has been doing lot of traveling on bicycle and trekking in such regions as Mongolia, Iran, and Siberia. Jola works as a theater teacher, with adults and children. She also has her own theater group "59 minutes" in Warsaw. Pawel, Warsaw Grotto, has done a fair amount of caving, starting at the age of 15, including several of Bill Stone's projects. The best thing by far he has discovered while exploring caves are the people that come to expeditions. Many of them have become his friends. 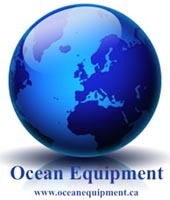 Pawel works as an oilfield service hand in offshore Norway. Pawel knows Mike Frazier, who can climb a big tree and turn it into a pile of firewood before you finish your coffee. Gosia Skowron-Suchodolska has been a member of the Warsaw Speleoklub since 2009. She has been caving in the Tatra Mountains. Gosia has been doing a lot of travelling in Europe (the Alps), Asia (the Altai Mountains) and the USA. Gosia works as a vet with surgeon specialization. In her free time she teaches horse riding and takes part in horse jumping competitions. Morgan grew up in Tallahassee, Florida where he started cave diving in high school, beginning a trend of antics his family has graciously put up with since. It took longer than he likes to admit for him to realize that there were caves filled with air, too. When he found several of these Florida "dry caves" he quickly understood he was enthralled with the underground world in general. After discovering "elevation" upon moving out of Florida, his interests grew to include deep caving and rock climbing. Morgan loves just about anything outdoors and is passionate about preserving wild places through exploration, science, and public outreach. This will be Morgan's third expedition to Mexico, and he is very excited to have the opportunity to be a part of such an amazing endeavor with world-class explorers. Morgan is currently pursuing a PhD in geoarchaeology at Texas A&M University and works for the National Park Service as an archaeologist. 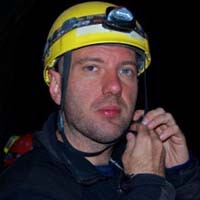 Elliot Stahl started caving in 2004 mainly in the TAG region of the southeastern US, but has also participated in expeditions to Montana and México. He graduated from Indiana University in 2012 with a degree in Geology. When not caving Elliot also enjoys, hiking, nature photography, and herpetology. Dr. Stone has been responsible for organizing and participating in the exploration of Sistema Cheve (-1484m), Sistema Huautla (-1545m), Cueva Charco (-1286m) and J2 (-1229m). During the past 45 years Bill has organized and led 70 expeditions. He has spent more than 9 years in the field on these projects of which 585 days were logged below ground based from underground camps. The longest single mission was 19-1/2 days operating from the -1200 m level of Sistema J2. 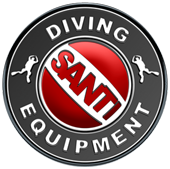 He has designed seven generations of rebreathers for diving, including the Poseidon Se7eN that will be used in Cueve Cheve in 2017. Bill is the principal author of the Time-Warner book "Beyond the Deep." 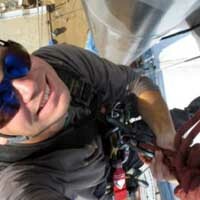 He is skilled in cave diving, subterranean lead climbing, cartography, rigging and cave rescue. The middle son of expeditionary leader Bill Stone, Rob was coaxed into numerous caves of Germany Valley, WV from a very young age with the promise of candy and ice cream in exchange for squeezing through the tightest fissures. Years later after a few trips to Hellhole and an expeditionary trip to Infiernillo in 2003, Rob is back to finally get the ice cream he was promised. 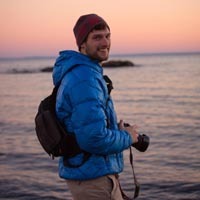 Rob is an art director and outdoor photographer and is excited to bring those talents to Mexico and document the wonders of Sistema Cheve. Jordan starting poking his head underground near his hometown in New Mexico and has since somehow found himself totally in the dark. Jordan built his technical skill base rock climbing, mountaineering and canyoneering, but was easily able to make the transition to caving upon realizing how much more rewarding wallowing in fresh bat guano was than rehashing old climbing routes from the 60�s. 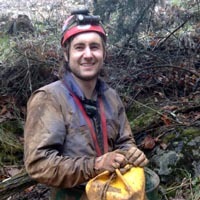 A graduate of Geology from Montana State University and an active member of the Northern Rocky Mountain Grotto, Jordan has spent the last few years exploring, researching and mapping caves in the northern Rockies as well as participating in other US caving expeditions in the Grand Canyon and on the summit of Mount Rainier. Victor started caving over 15 years ago in the Carpathian Mountains in his home country, Romania, as part of Speleoteam caving club that he co-founded. Growing up in cave country was just the beginning of his caving career; he discovered, explored, mapped and organized small scale expeditions in the Romanian karst. He is also the founder of Speologie.org, Romania's #1 online cave database and community. Recently he moved to the United States and joined project caves in West Virginia and Virginia. He is full cave diver, and enjoys SRT and digging. In real life he is a father, has a MS in Automatics and Computer Science, and works for Blink Interactive in New Jersey. I'm close to being one of the most passionate cavers! I live in my Jeep in the Rocky Mountains (Canadian winters are not that bad), so I can feed my addiction to caves and chocolate milk. An example of what I mean by addicted is I average over 200 days caving per year. I love this activity! Somehow I have been holding down a job working as a cave guide in the Canadian Rockies and on Vancouver Island, which has allowed me to have caved in China, Cuba, México, Peru, USA, and of course at home in the mountains in Canada. I am an avid climber and diver (love those miserable Canadian sumps! ), which fits well as I am also the expedition leader for the Raspberry Rising project. Matt Vinzant grew up in Florida. He has been caving for 17 years, diving for 18, and intermittently sump diving for 15. 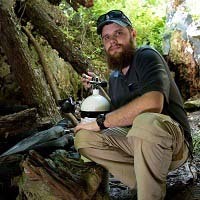 He has participated in cave exploration projects throughout the southeastern United States. 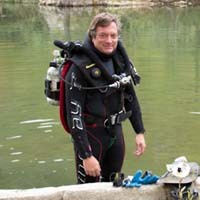 He is on the BOD for Karst Underwater Research and specializes in deep, long-range CCR exploration. For a living he is an Environmental Scientist with the local water management district working to reduce groundwater withdrawals from agriculture operations.